Frank Moss Bennett, English artists painting genre scenes | A painting found given by the Timothy Eaton Company to J G Stanley, their ceramics buyer in the 1930's | Story and photos, biography. that it is breach of copyright. Before the Hunt: Oil on canvas 32 x 22"
Frank Moss Bennett is best remembered for his prolific range of historic genre paintings that were set in the sixteenth, seventeenth and eighteenth centuries, though he lived well into the mid 1900's he chose to look at the past for his artistic inspiration. See his works as you would fictional movie sets and you will literally get the picture. Born in Liverpool, he studied art at the St John's Wood School of Art and at the Slade and RA schools, where he won a travelling scholarship and a gold medal. Exhibiting also at the RA, RI and Paris Salon. Frank Moss Bennetts favourite subjects were steeped in 'olde world charme' such as tavern scenes and particularly red coated hunting scenes and everyday life for which he is famous. yet his output included Elizabethan and Stuarts, Dickensian and historical figures, Cardinals and did a goodly amount of portraiture, all fulfilling a middle class public demand for art of its kind. Painting this type of retrospective genre scenes brought about much commercial success to Frank Moss Bennett and many of his works were commissioned by entrepreneur publishers to be sold across the world where you will see them commonly. It has been reproduced over the years many thousands of times and has been his biggest commercial success as a painting. You will find it today featured on print seller sites all over the internet. Today you will find Frank Moss Bennett's works recreated in books, as department store furnishing prints and even as jig saw puzzles. It is rare though that we come across a legitimate painting by Frank Moss Bennett, but a superb example, with wonderful provenance appeared at the Pickering Roadshow in September 2008. 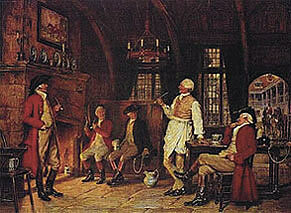 The oil painting (IMAGE (NOW REMOVED) called 'Before the Hunt,' by Frank Moss Bennett, was given a gift from the Timothy Eaton Company in Toronto, Canada to one of Timothy Eaton's most trusted employees, his buyer J G Stanley. 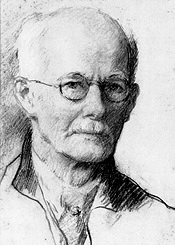 Put into perspective, Timothy Eaton was one of Canada's retail genius' of the early 1900s. He pretty much brought about the whole concept of the modern department store and eventually had shops which exist to this day in virtually every city in Canada. He was an impresario and major benefactor of the arts and education, and he is held in high regard across the country. Eatons name and his entrepreneurial genius are synonymous with the development of the retail trade in Canada. As such, in his first department store in Toronto, he employed the best buyers that money could buy to scour the globe for antiques, paintings, furnishings and fabrics and J G Stanley was his key ceramics buyer at Timothy Eatons and contributed to the companies success. Now, as a department store owner, it was inevitable that Timothy Eaton would aslo sell furnishing prints. Inexpensive, lithographed works of art on paper, stripped and bonded onto canvas to give the appearance of a painting. Which is exactly what we see across the Dominion a hundred times over. So many of these furnishing prints which are believed to be paintings, AND particularly those works of art originally imagined an paintied by Frank Moss Bennett! Within literally minutes of the real McCoy coming in to the Roadshow, this stripped and bonded facsimile paper print from a department store emerged. Called 'The Winning Throw,' the common misnomer, is that its a painting and we can guarantee to see between 50 and 100 of these furnishing prints acrposs the country on the roadshow tours each year. But it's a myth now completely busted are confirmed from the printed details which appear beneath the frames rebate on the print itself. Printed in England! A real Moss Bennett of this size? It's value around the six figure mark. The print more like six!